Description: NS engines swithc Enola Yard with an interesting car caring sections of track. 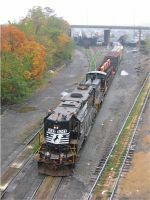 Description: A trio of NS SW1500's are in the yard in Raleigh, N.C. Title: NS 2213 & 2211 lead a GP15-1 towards Boylan Jct. Description: An array of power rests at the Juniata Shops. Description: An sw1500, a retired SP90MAC and an SD50 that will become NS SD40E 6337.